A man has admitted causing £550,000 of damage by setting fire to a sewage pumping station at Dundee's dock area. Dean Yeats started the blaze at the King George V Pumping Station by throwing lit paper at the building. Firefighters found him standing feet from the fire and had to wrestle him away as he threw paving slabs and bottles at the blaze. Yeats, 25, of Forfar, admitted a charge of culpable and reckless fireraising on 16 February. He was released on bail and will be sentenced at Dundee Sheriff Court on 24 November. Depute fiscal Nicola Gillespie told the court that Yeats was seen in the area by two witnesses. 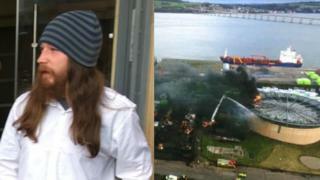 Ms Gillespie said: "The accused was shouting 'no, no, no' and went towards the fire. "The accused then approached a member of the public and said 'it was me, I didn't mean it'." "A firefighter in full personal protective equipment shouted to come towards him but he continued acting in an extremely agitated manner and the firefighter had to pull him away by the arm." Defence solicitor Craig Scott said: "He can offer no explanation other than that he accidentally discarded something that he had already lit and the consequences to put it mildly were exceptionally unfortunate. "He suffers from a form of drug-induced psychosis and is engaging with professionals in relation to that." Sheriff Alastair Carmichael deferred sentence for social work background reports and a psychiatric report.